On a few occasions recorded in the Gospels, Jesus talked about being a steward. He reminded His listeners that everything they had came from God and they were to view those things not as owners but as stewards, someone who takes care of something knowing well it rightfully belongs to another. The teaching includes: The 6 general observations about being a steward. The 3 things the Bible teaches are we stewards of. The 5 specific tendencies we have that reveal whether we are thinking like a steward or an owner. 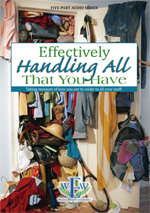 Effectively Handling All That You Have ... a teaching to educate, motivate and challenge.